Did you grow up with the commercial where the chocolate bar ended up in the peanut butter? I am probably dating myself. Who doesn’t love the combination of chocolate and peanut butter? The good news is that peanut butter is a healthy food (without the added sugars and oils), so if you keep the amount of chocolate in check, you could have a relatively healthy candy. Instead of using the oven to make these, you use your freezer. Because these are made by YOU instead of Hershey’s they need to be kept in the refrigerator or they will melt. Sad, I know. I’m not sure how they do it - though it may be that they use something called “TBHQ”. Since you don’t have any TBHQ, you will have to use your fridge. If you do have TBHQ, can you tell me what it is? These are simple to make and kids love them. They are a bit messy when you start to swirl them into the chocolate so don’t wear your best silk blouse. I love these with my afternoon coffee or as a portion controlled dessert. Don’t tell your partner that you made them or they might end up gone. My husband found these addictive. What is your favorite peanut butter and chocolate recipe? To crush the salted pretzels, place them in a plastic bag and smash with your hand or the back of a large spoon. Mix peanut butter and pretzels in a small bowl and chill in the freezer until firm for 20 minutes. Using a teaspoon measure, make 20 balls and place them on a parchment paper lined baking sheet. Freeze balls for 2 hours or overnight. Melt chocolate in microwave on medium for 1 minute. Stir, then continue microwaving for 20 second intervals until melted. 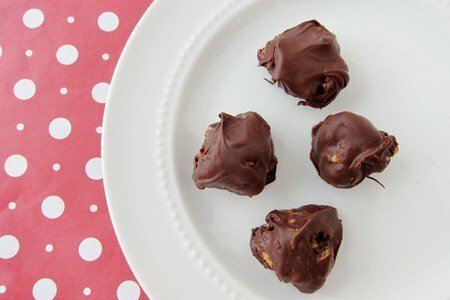 Roll frozen peanut butter balls in melted chocolate and refrigerate until chocolate is set, about 20 minutes. I make something similar, but use mini cupcake paper and pour melted chocolate on top, then freeze. Kind of a lazy version. Love the idea of using crushed pretzels. I do experimental baking and use my office mates as guinea pigs (they love it) and I will definitely make these and bring them in. No experiment here!!! I make a protein packed peanut butter snack that my kids think is candy, but so much healthier. Combine equal amounts (I use 1/2 c.) peanut butter, powdered milk, wheat germ, and honey to make a dough. Roll bite size pieces in cocoa powder and wrap in wax paper squares. I keep them in the refrigerator. Huge hit! Kids love'em too! Yum!!! Thank you! Also like the cupcake liner idea above. So happy to have found your blog... Love this recipe. Great way to satisfy a craving. I'm thinking I may make these and pop them in the freezer!! Hmmm - I think I'll try mixing the peanut butter protein recipe (thank you Melanie - equal parts, got it!) with some pretzel balls, then drizzling dark chocolate over the top of each cluster. I'll still get all the flavors but not so many calories. Thanks for the suggestion! I'd make a healthier version with raw almond butter, gluten-free pretzels, and melted 90% dark chocolate. And/or experiment with ground nuts, cacao nibs, coconut, flax seeds, chia seeds, etc. in lieu of the pretzels. Options are endless. Yummy! Fabulous recipe! I love chocolate, pretzels and peanut butter together! Yummy!! "You got your peanut butter on my chocolate!" "You got your chocolate in my peanut butter!" Oh yea, I remember those. I always thought the way that commercial candy makers did it was to use wax in the chocolate. Could TBHQ have something to do with wax perhaps? (NaturalNews) TBHQ is used in many foods, ranging from crackers to crisps to fast foods. It is also found in certain brands of pet foods, as well as in cosmetic and baby skincare products, varnish, lacquers and resins. It is used in the stabilisation process of explosive compounds. The risks and side-effects of this preservative product far outweigh the benefit of it being used as a highly unsafe preservative ingredient. Tertiary Butylhydroquinone, or TBHQ as it is more commonly referred to as, is in fact a chemical preservative which is a form of butane. It is used in foodstuffs to delay the onset of rancidness and greatly extends the storage life of foods. It's no wonder that certain fast foods and convenience foods seem to last a lifetime on the shelf these days. In Ohio, we call these Buckeyes leaving a little of the PB exposed to look the tree nut it is named after. There is nothing healthy about them because we use lots of butter and sugar. This will be a good alternative to try out! I have read that coconut oil with make hard shell chocolate out of regular chocolate. That might work. Chocolate and peanut butter...probably the best combination there is in the food world. For times when you need a fix, I have just found "UNREAL" chocolate. Interesting concept of trying to unjunk our treats. I must say their chocolate peanut butter cups are amazing. Half the sugar, no additives, preservatives, GMOs, corn syrups, etc. Snack girl...would love you to give them a review!!! Snack Girl, could you use the PB2 versus real peanute butter? Can I use PB2 for this recipe?